Change is inevitable. We can’t stop the change. Each second, each minute something about our universe has changed. And we can never go back to the way it was. But, oh, how we try. We cling to “what used to be” even when the final shreds of hope disintegrate in our hands into nothingness. We can try and fight it, or stubbornly sit on our rear-ends, but no matter how hard we try, things are never going to be the same again. We CAN embrace the change in it’s inevitability. We can choose to go along for the journey and see where change takes us. We can choose the path of destiny and fulfillment. Hope lies not in the palm of tightly gripped hand, but in the freely thrown up palm reaching for the heavens in an accepting gesture. We can instead hold on to the steady rock that keeps us safe in the darkest nights, in the fiercest storms, in the lowest valleys. We can hold fast to the knowledge that change brings healing, hope, a future, a peace that we have never experienced before. Lessons are learned when we embrace change. Loss is part of life. Hope is part of heaven. So there you have it. Enjoy! Personality traits are like that, a gift AND a curse. You and I were pretty much born the way we are, we didn’t have a say in the matter. We are like lumps of newly formed clay, ready to be shaped by family, time, and circumstances. Very occasionally that shaping forms a near-perfect human that can manage life well. But mostly, we turn out slightly misshapen, with an oddly placed handle here, or a slightly twisted rim there. Then we become adults. All of that molding and shaping that had been going on by the people in charge of us comes to a screeching halt, and, well, we are what we are. Do you feel like this inside? Then, we go through the fires that hardens the clay and solidifies the shape we were when we stepped into adulthood. Because life is like that. Trial by fire. Will we survive, or won’t we? Sure, we have to accept ourselves for who we are, and so should our loved ones. But, I truly think that this only goes so far. It’s hard to be around someone with an anger problem. It’s hard to keep throwing paddles and a boat out to someone who is stubbornly (yes, I say “stubbornly” because you and I can choose to be despondent, or not) stuck in a pond of despondency and despair. We start to feel the the moments that the oddly placed handle gets in the way, causing all sorts of problems. We feel embarrassment when the slightly twisted rim keeps spilling the liquid inside at all the wrong times. Sometimes whole pieces fall off, or we are dashed to the tile floor and break. In many cases, people throw up their hands after several failures and say, “I’m never going to change!” We are what we are, right? Why bother trying? Well, yes, and no. The truth is, we can’t change our genetic inheritance, but we do have a choice in how we use those traits: we can choose to stay the way we were shaped, or we can choose to, effectively, start over by smashing up the broken vessel and getting some fresh clay. You already have the ingredients you need: personality traits, learning experiences, belief systems, relationships, and etc. You can decide which ingredients you are going to use, and which you are going to throw out. You can decide how those personality traits will manifest in the real world. In other words, you decide who you are and how you behave. You get to choose the colors and the shape. That’s right. Shall I say it again? Or not. It’s up to you to decide. *Author’s note: Before I get started here, I would just like to say, I love it when you come to visit. Yes, I mean you. I would love to sit down and have a chat with you. I would love to hear what you have to say on whatever I write about. So, if you come by, why not leave me your calling card, or a nice little note that let’s me know you were here? Frankly, it encourages me to keep doing what I’m doing. In other words comments are welcome and encouraged here. I generally leave a little question at the end as a prompt to get a discussion going. You can answer it, or not, as you prefer. I had a powerful experience on Saturday that got my juices flowing and the wheels spinning for my little bloggity once again. The sucky experience that I am having is still sucky and I am still experiencing it. But, I feel the need to talk about something that I feel is very foundational to overcoming emotional difficulties: knowing yourself. In “The Matrix” Neo goes to visit the Oracle to find out if he is “The One” (i.e. the savior of their world). She points to her little sign in her kitchen (which says Temet Nosce, by the way. This is just a variation of the phrase) above the doorway and explains to him rather bluntly that if you are something, you just know it. You don’t need to be convinced by your friends, you don’t need constant reassurance, you just know it. I know that I am a good mother. I know that I am an artist. I know that I am gifted in counseling others. I know that I am a Christian. I don’t need other’s to affirm this, I just know. I truly feel that I am meant to do this blog, and to write books. But, one thing I have had a hard time convincing myself of is that I AM a writer. As in, “this is my identity.” As in, “Hi. I’m Stephanie. I’m a writer” (Not that I would actually introduce myself that way. But, I think you get my point). I feel a little surprised when people praise my work here on this blog. Sometimes, I almost don’t believe them. Silly, I know. This question has stopped me from moving forward in doing the things that I am meant to do. I just couldn’t see myself doing the things I am meant to do because I couldn’t (or perhaps wouldn’t?) believe in my identity as an writer. But Saturday changed all of that. I met with about 4 other people. 2 of whom I have known a really long time, 1 I knew fairly well, and 1 I sort of knew a little. We met together to encourage each other. To help each other overcome the log jams stopping us from flowing in our gifts. I spoke for a while about where I was on a few things, including the I’m-supposed-to write-books-but-can’t-get-started-because-I-don’t-believe-I-am-an-author problem. The leader of our group (Rob Stoppard. A great guy, you should check him out) said to me people get stopped up in doing what they are meant to do because they believe lies about themselves. Lies like “I don’t love writing so how can I be a writer”, or “I am never going to change”, or “I can’t change”, or “I will always be (fill in the blank)“, or whatever you say about yourself. The only way to combat this is to change your habit of lying to yourself, and start telling yourself the truth. I think if you look deep in your heart you can find your gifts, your talents, and your identity. It’s like a treasure box just waiting to be opened, and you hold the key to open that treasure box. And, if you open it you have to decide what you believe about what’s inside. You have to decide that the treasure is who you are, or not. But sometimes, even we do this, we get lost on our way back. Parts of the treasure get lost and never make it home. Like me and this writing thing. The group had me do an exercise that has forever changed my life. They first asked me to look in the mirror and say out loud to myself, “I am a writer.” I felt more than a little shy about doing this. So, they offered themselves up to act as a sort of mirror. I had to look people in the eye and say out loud, “I am a writer.” They took it one step further and had me say, “I am a famous writer.” And although it was a little difficult to look people in the eye and say these truths out loud, I did just that several times. I stated a few other things I have had a hard time believing lately as well. As soon as I said these things, it’s like a spotlight was suddenly focused on my poor, lost treasures. I could find them, and bring them home. I could take them within my psyche and revel in the simple pleasure of knowing myself. It was like being born again. And now, I feel free to do what I am mean to do. I believe that I am a writer. That even I can be a famous writer. And you are free to discover things about yourself you never knew. You can go on a quest to find your treasure, to change your life into something better, to become who you are meant to be. My opinion on opinions. Or something like that. My response to this is, “Oh? Really?” I don’t know who said this (Frankly, I don’t care), but this seems to be in response to that thing that happens when we worry about what other people think of us. You know, that thing where you start making other people’s opinions more of a priority than your opinion. As I was researching this statement, I ran across a blog post where a person stated that worrying about another’s opinion is encroaching on someone else’s property. That’s an interesting notion, but I am not sure I completely agree. My problem with this kind of statement is that it general enough for people to take too far in the wrong direction. Having an opinion is part of being human. You know, “I opinionate (I know, not really a word. Just go with it. ), therefore I am.” Or, something like that. Opinions are like the Force. There’s a light side, and a dark side. There’s no such thing as a neutral opinion. Opinions frequently smash together like atoms out of control. Opinions can be either helpful, or non-helpful. Helpful opinions can inform and uplift another person. Non-helpful opinions can tear down and disenfranchise another person. Everybody’s got a million of ’em. Some of us (ahem) are more opinionated than others. Some of us (again, ahem) share our opinions more frequently than others. The notion that other people’s opinion are none of my business because it’s their intellectual property seems like an overreaction to idea that another’s opinion shouldn’t define who you are. Yes, only should define who you are. 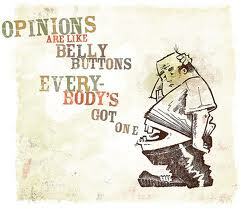 Yes other’s opinions are just their opinions. People do use them to hurt, control, and destroy other people. Those opinions should be ignored, and are none of your business. But those opinions aren’t the ones I am talking about. I find other people’s opinions of me helpful. Even the bad opinions. I tend to view other’s opinions as an object I can hold in my hand. I can look at, ponder it’s meaning, and put it down on the nearest horizontal surface. It matters to me what other people think of me. Here’s why: if I am doing something that is a problem in my interpersonal interactions, I need to know so I can work on it. I need to wonder what other people think of me, because there is always room to grow. This part of the human need for social order. We have to define our place, and our contribution to the society we live in. If we are not actively contributing, or worse causing disruption in, to the society we belong to, we are limiting our capacity to be fully part of that society. One has to be discerning and honest about themselves to consider another’s opinion of them. One needs to be willing to face their own weaknesses and downfalls. One has to be humble enough to admit to the need for change. So, don’t swing too far in the wrong direction. Consider other’s opinions without taking them in and letting them run like schoolchildren with scissors waving frantically in the air. Make them behave themselves and reveal truth to you. Talk to those opinions and form your own conclusions. Make good, honest changes in yourself based on those truths. Let other’s opinions help to define how you react to the world. If you are visiting here, why not leave me a little note to say, “Hi!”? I’ll say, “Hi!” back! Well Just Write! is over. But, I had the urge to sit down and write something. So like Mary Kathryn says “looks like our experiment worked for me!” Hear, hear! In life, so much of how we behave is based on perception. In psychology (of which I am an undergrad student), learning and behavior typically go hand-in-hand. Psychologists have been trying to figure just how learning works. It is basically understood that our brain is a plastic mechanism that takes in information, processes it according our experiences and our genetic make-up and spits back out a reaction, or behavior. When we are conceived, God chooses our eye color, hair color, personality traits and characteristics, and etc. We are born with a basic construct. For those of us who believe that we inherit spiritual factors at conception, we are born with both the good and the bad from our family lines. As soon as we are born, we start learning. We learn the smell of our parents, which voice belongs to which face, how to get what we need (i.e. crying for just about everything), and etc. From birth on, our basic personality structure and learning experiences color how we react to our environment. For example, my own basic personality has stubbornness/persistence woven into it’s structure because I inherited the physical genes that make me this way from my mother and my father. I used to be just plain stubborn, now I am persistent. I used to be stiff-necked and unyielding, now I (mostly) use this trait to help me keep pushing forward into a better place in life. How I perceive this trait in myself depends on my perception of myself. How other’s view this trait depends on how other’s perceive me based on their own experiences. We sometimes call this a filter. We receive information about our environment, our brain filters the information according to our understanding of things and says “Okay, this input is like this experience, and this is what you usually do”. We are more likely to react a certain way in any given situation because of our experiences. Sometimes we are aware of this, and sometimes we are not aware of this. If I perceive myself as stubborn, I will more than likely behave in a stubborn fashion. If perceive myself as persistent, I will more than likely behave in a persistent fashion. How we react all depends on how we see the situation. This is where Jesus comes in to the picture. As a Christian, I have a choice; I can either choose to see life and myself wrongly, or I can choose to see life and myself through rightly or according to the truth. As a Christian I understand that Satan wishes to convince me to chain myself to lies so that I am useless to God and behave wrongly. Satan wants me to see life through Satan-colored glasses. Satan will strive to convince us that we need to keep believing his perception. Believing in lies never gets us very far with God. Instead, I need to learn the truth because Jesus wants me to view life from his perception (i.e. THE TRUTH), or through Jesus-colored glasses. It’s our choice everyday in every moment whether we believe the lies or we believe the truth. If we take off the lies from our eyes and look at things from God’s perspective we understand what is happening from a different point of view (i.e. THE TRUTH). Life, ourselves, and others begin to look different to us. We begin to see that person that used to irritate us the way Jesus sees that person. We begin to understand that persons difficulties. With God’s help we begin to feel compassion for that person and react to them with grace. If we allow the truth to permeate our being, we react differently to our circumstances. We start to behave in way that brings life and light to our life and other’s life. God’s truth starts to shine through for others to see. When we allow ourselves to life from a God perspective the kingdom of darkness loses another soul and THE KINGDOM OF LIGHT WINS. Satan no longer has control. Isn’t that worth putting on Jesus-colored glasses?